When it comes to custom packaging, thermoforming is about as literal as you can get. Design and personalization appear in all of our projects. But when it comes to truly crafting packaging around a product, thermoforming provides the best amount of customization. This style of personalized packaging takes a sheet of plastic that is heated until pliable, and then molded to the desired shape. You've experienced a variety of thermoformed packaging, and maybe not even realized it. For example, any time you have opened medicine in a plastic container with a foil back... That's blister packaging. If you've slid a plastic tray out of a box... That's a thermoformed tray. The incredible array of possibilities for thermoforming is part of what makes it such a dynamic industry. Digital Journal projects that the market for thermoformed trays, blister packs, and more will see steady growth through at least 2026. Plastic trays and custom plastic packaging have become an important aspect of packaging. As more and more people turn to shopping online, the need for packaging stability and protection increase. Not to mention the ability to capture freshness and keep products firmly sealed. When it comes to specific industries, thermoforming allows them to not only package with integrity, but also with precision and intentionality. Take a look at the image to the side. These cosmetics are packed in safely and securely, but also with an element of presentation. All users who purchase this product will be able to have a consistent experience, from any part of the country. Not to mention that these containers, otherwise fragile and full of precious substance, are protected from the potential pitfalls of transit and retail shoppers. Healthcare packaging is another industry which often uses thermoforming. We discussed pill packaging above, but this style of single-servings also helps with compliance packaging. Compliance packaging ensures that users are taking the correct dosage/amount at the right time. Adding features to the packaging design, like a clock or other graphics, along with the individual blisters, assists users in being responsible and understanding how their medication works. These two industries are hardly the only ones out there using thermoformed trays, blister packs, etc. The food industry, horticulture, electronics/technology, and more have adopted thermoformed products as part of their packaging lineup. Learn more about the options we can provide to you to keep products safe and sound through our thermoforming options! Part of the fun of the packaging business is getting to know a variety of industries. From key fob packaging to software FlashPads, there's always something new and exciting being created. It even extends into the realm of political action, as is the case with cannabis kits. As of January 1, 2018, cannabis or marijuana is legal in California (with some regulations, of course). HauteSmokes is a startup specializing in smoking accessories for the sophisticated smoker. We designed packaging that complements their take on the glamour and the *je ne sais quoi* of the industry. As with any product that requires packaging promotion, we started with the basics. How can we help them promote their business and give their customers a treat to open? As stated above, HauteSmokes cannabis kits are all about creating a kind of old-Hollywood feel while staying relevant in the modern age that is marijuana legalization. As more and more states move toward legalization, their market is sure to grow. For California alone, experts estimate that legalization will have nearly a $5 billion impact. And Forbes estimates that the industry will create more jobs than manufacturing by 2020! So when it comes to creating custom packaging that not only meets their current needs, but the potential growth as well, we knew it had to be something innovative, sophisticated, yet somewhat reminiscent of old time glamour. Sunrise Packaging started with a magnetic box, or the MagBox, for that element of modernism. Magnet closures are satisfying and delightful for users. They're also perfect for protection for these delicate pieces - no accidental opening for these packages in transit! For decoration, the magnetic boxes were wrapped with black ultima. This custom box wrap has a slight gloss, and is smooth to the touch. The gold foil stamping on the box seals the deal. Gold on black is a standard of Art Deco style, the roaring 20's, and old-time Hollywood. Custom box design can be full of references, and we love bringing these elements together for creative projects. Whether you agree with it or not, the legalization of cannabis doesn't appear to be slowing anytime soon. And based on the projected market for it, there's plenty of opportunity as well. 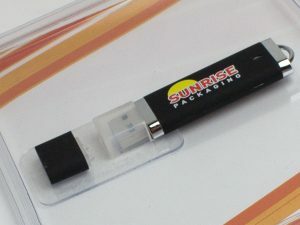 Get a head start on your cannabis kits with Sunrise Packaging. Contact us today! Compliance packaging is a friendly way to help consumers take their medication on schedule. And blister packaging provides the perfect platform for it. Let’s establish why compliance packaging is such an important issue today. If you’ve ever been charged with taking a medication daily, there have surely been days when you forgot about it. Whether that lead to unintentionally skipping a day or just a few hours, it has an effect. Or maybe you’ve been prescribed a device that you’ve been using incorrectly. Inhalers are notorious for misuse. With over half of the US population on some kind of medication for a chronic condition, nonadherence is a big issue. So much so that a 2008 Medco survey estimates that half of those people don’t adhere to the given guidelines for their medication. A year later, the Network for Excellence in Health Innovation cited this as responsible for up to $290 billion in unnecessary costs every year. As mentioned above, compliance packaging makes it easy for users to to take the right dosage at the right time. Here are some examples from the 2016 HCPC Compliance Package of the Year winner of how they used blister packaging in their design. The winner created packaging for a two week dosing regimen. The blisters are designed like a calendar, with each box making up two two-week packs. With red arrows leading the user from pack to pack, it’s clear how they should progress and take the dosage. 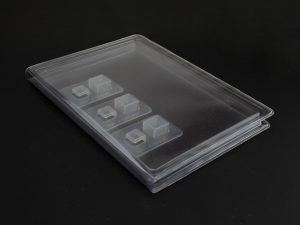 The thermoformed blister packs ensure that the user doesn’t take more or less than is prescribed. 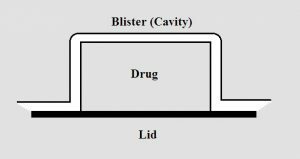 In addition to keeping the dosage consistent and accurate, blister packs play another role. With the aging baby boomer market, packaging accessibility becomes a consideration. Being able to open pill bottles requires dexterity and hand strength… Something we tend to lose as we age. Blister packs allow for users of varying strength and dexterity access with ease. While the term is usually applied to the pharmaceutical or medical packaging industries, compliance packaging measures can apply everywhere. Making retail packaging that’s easy to use, regardless of hand strength, is a standard to which all packaging should be held. Designing labels and lids for thermoformed packaging that inform and educate users is a great use of space. What measures has your organization taken to create a compliance packaging approach? As packaging professionals, we tend to see the beauty in all types of packaging. Others...maybe not so much. However, there's one variety which nearly everyone can agree upon creates appealing packaging: beauty boxes. When it comes to the retail space, health and beauty packing needs to be ultra-competitive. Health and beauty products have to appeal from the first glance. Customers have to be drawn to a product. Sometimes that might happen via word of mouth. A friend, or an Insta-influencer, recommends a product. It starts a chain reaction of the prospect looking for a specific product. In this scenario, packaging is still important in that it has to hook the buyer for that final step of purchasing. In another scenario, a customer wants a certain result. Longer eyelashes, smaller waistline, smoother skin. They might have a product in mind, or they might not. This is where packaging needs to make the sale. How a brand chooses to project themself is apparent when it comes to beauty packaging. Some take the hard, gritty approach, like an Urban Decay or Kat Von D design. There's an aesthetic at work here, and a projection for customers. Others, like the example to the side, take a softer stance. These custom cigar boxes feature a digitally-printed wrap with soft touch lamination. The watercolor design is bright and inviting, while the soft wrap allows users to feel calm from the first touch. The logo is done with a silver foil stamp. It pops more than the printed design, but by enhancing and not overpowering. All of these elements contribute towards a singular perception for the product and company as a whole, echoing that delicate personalization. Features like these help set products apart in the retail space. Knowing what appeals to your customers is a key part of making the final sale. And it's even more effective when the customers might not be able to describe the effect they want, but know what it is. What we love about creating products like these is how it's never just one single feature that makes the packaging. It's the summation of its parts, like how the cigar opening paired with the soft touch creates a mental invitation. The digital printing paired with silver stamping create a delicate kind of branding on the brain, one that entices the prospective customer to learn more. What features do you employ to drive health and beauty packaging sales? Contact us today to create your next project! Sunrise Packaging is proud to be a Minnesota company. We take pride not only in the work that we produce, but the work that’s done around us in “L’Etoile du Nord.” That includes projects that inspire nostalgia, like any good throwback packaging. So it was with no small amount of excitement that, when one of the lead characters of Netflix’s series “Stranger Things” appeared on screen wearing a hooded sweatshirt from none other than our local Science Museum of Minnesota, we were pumped to hear that the sweatshirt would be recreated. And it seems that we were not the only ones. The Science Museum of Minnesota’s online store crashed upon the timed release. However, as the social media accounts for the museum reiterated, there was an unlimited supply. All told, it’s rumoured they sold over 80,000 pieces of ‘Thunder Lizard’ apparel in one day. If that doesn’t speak to the buying power of nostalgia, I’m not sure what does. “Stranger Things” is a massive hit for Netflix. Any promotion that can tie back to it–directly or indirectly–is bound to have a leg up in the bid for capitalizing on consumer nostalgia. But it’s not the only example. At the height of AMC’s “Mad Men” popularity, brown liquor (whiskey, brandy, etc) outsold vodka and *clear* liquors for the first time in decades. The ad folk’s penchant for Old Fashioneds, as well as 60’s fashion, influenced a wide variety of industries. Don Draper of “Mad Men” fame gave a stirring pitch in season one based on nostalgia, calling it delicate, but potent. When it comes to your business, helping customers connect with your brand is key. This is where nostalgia becomes a powerful tool. NCR Silver lists some of the ways in which we can learn from the response to shows like these. 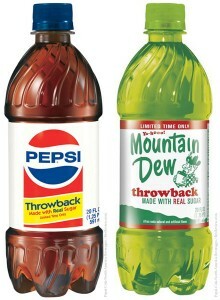 Familiarity is one of the most important factors in creating throwback packaging. It might link customers’ back to their childhoods or something else in their minds. This doesn’t have to be a literal recreation, like with the examples above. Taking inspiration within the culture and finding relevant themes can achieve the same effect. Like we said above, throwback packaging doesn’t have to be an exact recreation. Board games are one example. While games like Clue and Monopoly have been played for decades, they’ve found new ways to entice buyers. Game makers are resurrecting old packaging styles and typefaces, inspiring memories in customers. However, they’re also adding modern, interactive features that appeal to today’s audience. Creating brand advocates isn’t an easy thing for most industries. But from what we’ve seen, nostalgic packaging is one way there. Make sure to include hashtags, social channel handles, and other information is included on custom packaging. Not only does this generate more buzz, but allows you track more clearly as well! Collectors boxes have been around for a while, but what makes a good collectors box is less well-defined. If we take a trip back down memory lane, let's consider some of the retail packaging crazes within recent memory. Funko pop dolls come to mind. Minecraft. Pokemon. Beanie Babies. In the cosmetic packaging world, Urban Decay's special palettes sell out within hours; Kylie Jenner lip kits within minutes. Even cereal boxes, like the limited edition old school monster designs. And one of the most popular and omnipresent campaigns in recent history: the Share A Coke campaign, where individual custom labels entice customers to "share a Coke with... [insert name here]." Collectors Boxes: What Sets Them Apart? The easy answer? 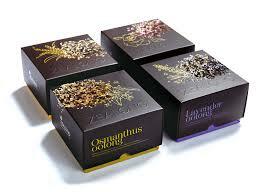 Put 'limited edition' in front of any custom packaging, and it will increase demand. But the success of these craze-inducing campaigns goes deeper than that. Sunrise recently partnered with Solid Ink to create unique collector's packaging. This project utilized a turned edge design with four color printing and matte lamination. Created for their unique Chris Garver and Horitomo collections, the project specifications demand that these custom box sets reflect the brand as well as the inspiration. Overall, it works as a great case study of what goes into a successful design and creation of deluxe box sets. In short, it's tapping into what your audience already knows and desires, tying it into your brand, and limiting access. Solid Ink created these limited edition boxes with the intent of creating demand. It's econ 101: supply affects demand. With these boxes in limited supply, and only available in certain places, it increases the demand. It might seem like a strange analogy, but the Beanie Baby craze of the 1990's is the poster child for this kind of strategy. As a particular Beanie Baby became more popular, the company would conscientiously pull it from the line up, creating--all together now--demand (and price inflation, but that's another story). It takes time, skill, and no small amount of luck to create something that captures the collective conscience and enters the zeitgeist. Most importantly, it has to have elements of originality. Even if something similar exists, or another version didn't quite succeed, taking time to find out what the missing element is could be the difference between a generic mobile app and Flappy Bird. The tattoo industry is all about originality and body modification as an art form. It makes sense that the stars of that subculture are held in high regard. Their name lends authenticity to products, and enhances the sense of uniqueness around a collectors boxes set. When your target audience recognizes someone they admire as part of a brand, it creates an instant resonance. Sunrise Packaging has a practiced hand at creating limited edition packaging and collectors boxes. We worked with Prince on album packaging, numerous sports teams on gifts for season ticket holders, and other types of deluxe boxes. Bring us your ideas, and we'll bring them into reality. High end retail packages speak to customers. Not literally, of course (but who knows what might happen in the future?). But all it might take is a swift glance over a familiar box to evoke a memory. Positive, negative, those parts of are out of control for manufacturers and companies, but the point is clear: when you have a strong brand that speaks to luxury, quality and comfort, your packaging should reflect that. Some might be quick to dismiss packaging as most important for mass produced consumer brands. It’s necessary for boxes to stand out on a crowded shelf, helping customers identify the one they want quickly. Or to catch their eye long enough to consider trying something new. But it’s the seed of brand loyalty that transcends economic status. Whether it’s a loyalty to Captain Crunch cereal or to Cartier watches, customers who exhibit appreciation for a specific product still want to feel like they’re part of the club. Cultivating that seed is partly done through packaging. It’s easy to assume what features a cheaper package might feature to cultivate brand awareness. Color is the main one, with graphics coming in second. 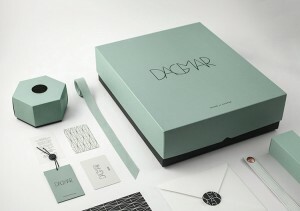 But when it comes to high end luxury packaging, customers want a little more. If you turned the lights off and ran your fingers over the packaging, what sense would customers get? Utilizing features like embossing, hot stamps, soft touch lamination, and more can stimulate the senses to entice customers in a different way. Opening and closing boxes isn’t something that registers with most people. Unless there’s something that stands out in people’s minds about it. Using a unique closure, like magnets or a custom molded snap enclosure, can do just that. Light reflects differently on different materials and colors. Using a matte finish with glossy embellishments will draw attention to the various contrasting elements. Or simply mix up the colors, pairing black with white or other opposites that work well together. An unveiling is a spectacular affair, and the first time your customers see your product–as their own product–should be as well. One way in which package designers do this is to add a moment before the *big reveal. * It’s like going through the wrapping paper to get to a birthday present. Your excitement is heightened because you know this is something you want, and the paper is the only thing in the way. Badly designed processes can lead to buyer’s remorse and increased product return rates. All things luxury producers want to avoid. We love talking high end retail packages. Different features work for different industries, and we’ve a bit of experience in the field to help guide you. Get in touch today! The weather here in Minnesota has been a little iffy, but with the Memorial Day weekend, we can finally say that summer is officially here. Which makes it the perfect time to start considering your custom holiday and Christmas packaging needs, right? Wait, what? Christmas packaging in June? Yes, it might sound a little premature to start thinking about the holidays. But, as one of my former professor was fond of saying, proper preparation prevents poor performance. For many businesses (well, except for ice and fireworks, maybe), summertime is a bit slower than the rest of the year. It’s a chance to relax a little bit, look ahead a little more, and gauge what’s coming around the corner. After summer flies by, then it’ll be fall. And as inevitable as tax season, the holidays will be here before we know it. Make use of this low-stress period by planning for your custom holiday and Christmas packaging now. The holidays are a high-stress time, from the end of October through the new year. There are a million things to get done before the end of the year–both at work and at home, making balance harder–which wears on us mentally and physically. If that’s not reason enough to start planning now, here are a few more reasons. The best gifts take time to craft and create, and the same goes for custom packaging. While Sunrise Packaging prides itself on creating the perfect package for every customer, the best products are the ones for which we have time to work through design, procure materials, and produce to our high standards. It also gives you time to explore the variety of options, and land on the perfect one for your needs. Like we mentioned above, the emotional hallmark of the holiday season tends to be more on the stressful than the joyful. Contacting Sunrise today means you won’t have to scramble to find a company that can take on your custom box order at the last minute. You’ll have time to proofread the copy, tweak design, and spend time on the different embellishments and finishing options that will showcase your brand best. When the holiday crunch starts, you can focus on products and leave the packaging to us. The experts. Leaving you free to focus on the various implementation, marketing, and everything else the holidays bring with them. Taking care of custom holiday and Christmas packaging now is kind of like giving your future self a little gift, don’t you think? 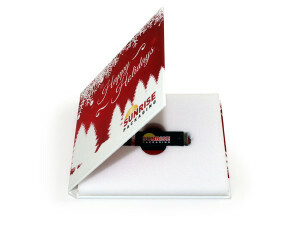 Whatever your personalized packaging needs may be, Sunrise can help. Check out our product galleries to start formulating ideas, and let us know when you’re ready to talk! Custom luxury boxes are more accessible than you might think. I know, I know. On the surface (literally), most people think of a striking finish with an expensive material. A complicated packaging structure. Something that enhances the aura of exclusivity by being nearly too complicated to open easily. Some marketing ploy might call it ‘delayed gratification;’ we just call it annoying. Minnesota’s Sunrise Packaging takes pride in designing packaging that meets the needs of your organization while satisfying customers. Not just satisfying–delighting them. There’s a conception that custom luxury boxes are expensive and maybe just a little too finicky to work for many products. Or, you might just want to flip the idea of luxury into something that’s still well-made, but doesn’t use those cliche tropes. Here are some tips to work toward high-end packaging appeal. Like we mentioned above, sometimes creative packaging errs on the side of confusing. Delayed instant gratification can come in many forms that aren’t annoying or confusing to customers. Allowing users to discover subtle details and functionality can add to their interaction with the package, the product, and your brand. Things like pull tabs, pop-up constructions, tissues, and more can add layers to the unboxing, making it extra special. How aware are you of the sounds around you? Next time you open a box or package, consider the sound it makes. Unwrapping the plastic wrapper of a candy bar, sliding a new phone out of a two piece setup box, snapping open a magnetic hinged box. All of these have different sounds that go with the items, and undeniably there are impressions of value that go along with each. The materials used in constructing your box will affect the pitch (thinner = higher, heavier = deeper), as will the finishing. If you don’t want users to have a high-pitch experience, which can read as cheap, consider that in the starting stages of your project. Haptic feedback is essentially the sense of touch in any given interface that provides information to the user. You might have noticed in your phone settings an option for ‘haptic’ feedback (usually a gentle vibration or other subtle cue). Video games use haptic feedback to enhance experiences, and it’ll be interesting to see how VR utilizes haptics. But when it comes to custom luxury boxes, haptics is all about the touch, feel and hand positions required to interact with a particular package. A great test is to close your eyes and interact with a box. Sharp corners and intuitive opening usually speak to quality and luxury; could your box be opened with eyes closed, or does it need power tools to break through? Ultimately, custom luxury packaging should speak to your customers in ways they can’t quite articulate, but they know they like it. This doesn’t have to mean spending more on packaging than on the product (although you get what you pay for in packaging – bigger budget means better materials). It can simply mean providing an experience for customers that makes them feel special.